A RAT infestation at Dun Laoghaire beach is causing concern for swimmers, families and dog walkers. Rats have been spotted on the rocks and on the beach, according to members of the public. The area is a popular beauty spot but the HSE’s environmental health section has stepped in and issued a warning. 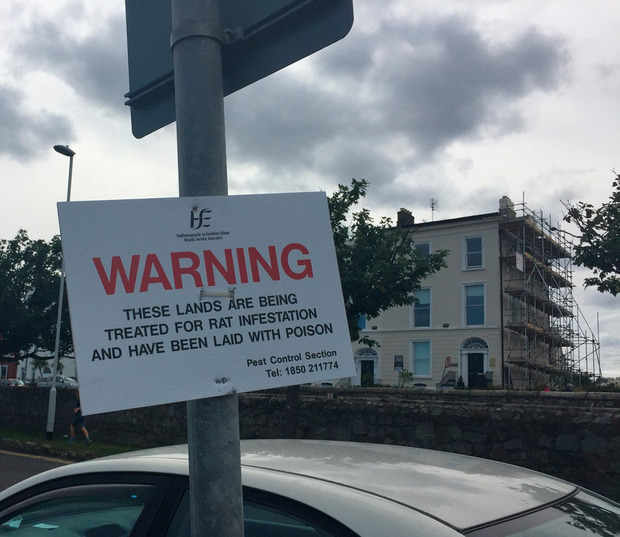 Ann Joyce, from Dun Laoghaire Residents’ Association, said: “I have seen the rats regularly when I’ve been walking along Queen’s Road, which runs along the coast. “I’ve seen them on the rocks and in reality we’re only a few feet away from them at any time. It’s a reality unfortunately. “The rats have been here a good while from what I can see and, if there’s building work, they’re disturbed. “There’s a fair bit of building going on round here at the moment so that might be why they are about and they’re always by the water. Ms Joyce said that, although it was concerning poison had been put down near where dogs are walked, she felt this would have been taken into account. However, Cllr Cormac Devlin said he was concerned about the safety of dogs and felt the HSE should have notified the public in a more obvious way. The Herald could only see one sign warning beachgoers about the infestation and poison and this was quite high up a lamppost by the east pier. “Sadly it’s not uncommon to have rats if there’s construction or at a certain time of the year,” said Mr Devlin. “I remember it happened when the east pier was being resurfaced [in 2008]. “It’s worrying but it’s good the HSE are trying to deal with the issue. “When notices go down, it’s generally from a high level of concern from the public and after a high level of sightings. “It could be bad at the moment and we also had a problem last year, when the HSE came in and placed bait out for the rats. “Dog walkers and people out swimming daily are the vigilant ones who tend to see them down at the seafront. But I would be concerned for dogs because, if they ingest the poison, it can be fatal, so I’d like to see a wider public notice on this. A Dun Laoghaire-Rathdown County Council spokesman said: “Unfortunately members of the public feed pigeons along the beach gardens area and this in turn attracts rodents. “Poison is laid from time to time depending on the presence of rodents. The poison was last laid during the summer in a way that is inaccessible to dogs.